B Scene Fuel is a Pump Top Television network of high definition screens located above the gas pumps at local convenience stores delivering local news, weather, & sports content along with your 15 or 30 second advertising message to busy consumers on the go. Your commercial announcement is received loud and clear by an audience held captive at the pump for an average of six minutes. 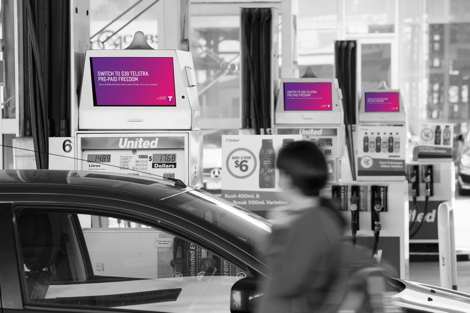 Today’s consumer is active and hard to reach, but nearly everyone has to stop for gas. You can be there when they do. B Scene Fuel is category exclusive giving you the ability to effectively shut out your competition from the medium.